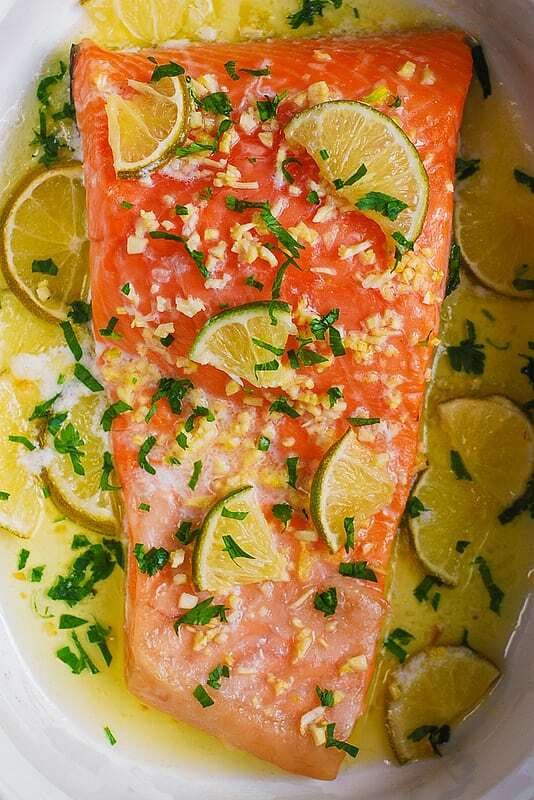 Easy Baked Salmon with Garlic Lime Butter Sauce – delicious, healthy, and, most importantly super-easy recipe to make! Just add the fish to the casserole dish, top with the rest of the ingredients and let it bake! And, it takes just 30 minutes from start to finish! When I bought this huge salmon fillet (it was about 1 and 1/2 lb), I wanted to make something very healthy and easy. That meant using very few simple ingredients. I also wanted the natural flavor of baked salmon to shine through, and I did not want to use any sweet ingredients. 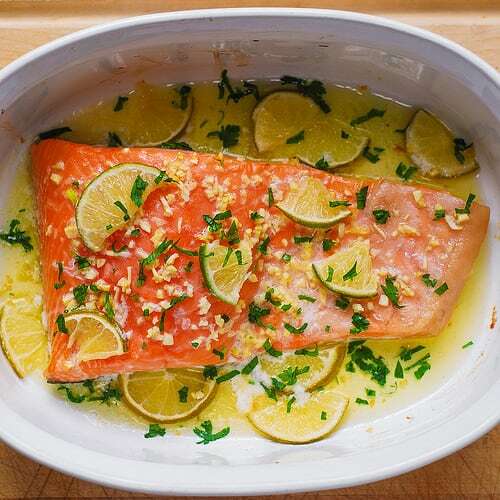 As a result, this easy baked salmon recipe is definitely on a very savory side. I am using freshly sliced lime and garlic as star ingredients. Butter is also a great addition, maybe not as healthy as the others, but with so many other healthy ingredients in this dish, we can afford to use some butter! Because it makes all other ingredients taste so good and, well, buttery! 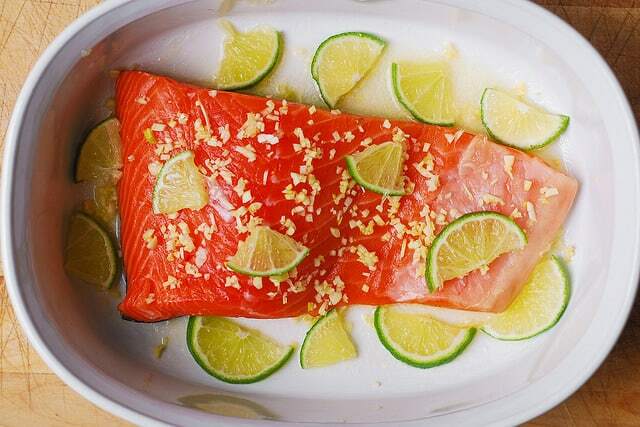 All you do is pile up minced garlic, sliced lime, and sliced cold butter on top of salmon and bake it to perfection! What is especially great is that the cleanup is minimal because you’re using just one pan, and it’s a casserole dish which you can easily wash in the dishwasher afterwards. Also, there is no need to use foil or parchment paper when baking in a casserole dish. Whenever I cook salmon, one of my main objectives is to make sure that once it’s baked, the salmon is moist and juicy, cooked through, and not dry. Who likes dry salmon? Not me. 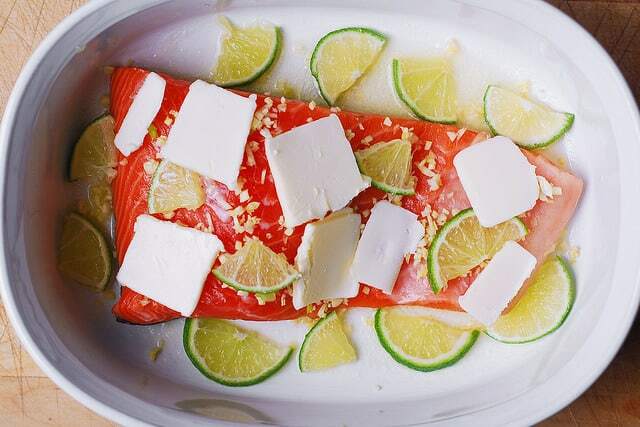 In this easy recipe, the use of butter and sliced lime adds some juiciness to the fish, and it’s also important to bake the salmon at the right temperature. So, how long and at what temperature do you cook salmon? I like to bake salmon at 375 F, not higher, for about 20 minutes. 20 minutes is really all the time you need for salmon to be completely cooked through. However, all ovens are different, some are hotter, some are colder than others. In some ovens, the salmon could be done in 15 minutes, in others in 20 minutes, or in some it might take even longer. Then, slice 4 tablespoons of cold butter and add it evenly on top of salmon. The butter will melt nicely during the baking process. Finally, bake salmon in the preheated oven at 375 F for about 20 minutes until the salmon is cooked through. Make sure to bake it uncovered. And, keep in mind, depending on your oven, the salmon could be done sooner (in 15 minutes) or later (in 25-30 minutes). Just keep your eyes on the salmon towards the end of baking. Easy! What is a good side dish with salmon? For this easy baked salmon recipe I suggest that you serve it with freshly cooked, fluffy Jasmine rice, and pour all the delicious garlicky buttery juices over the salmon and rice! YUM! Top with a small amount of chopped fresh parsley, and you have a great healthy dinner on your table! If you want something fresh and green as a side, try this sautéed spinach. For something more creamy and more comfort food like try these delicious Greek yogurt mashed potatoes. I hope you try this easy baked salmon and enjoy it as much as I did! 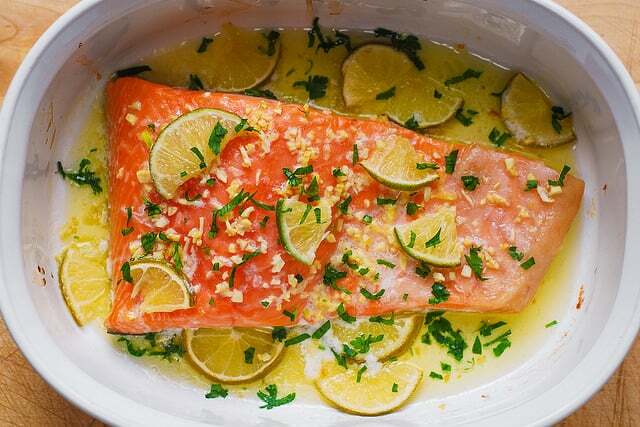 If you want an easy basic recipe for how to bake salmon, this is the right place! 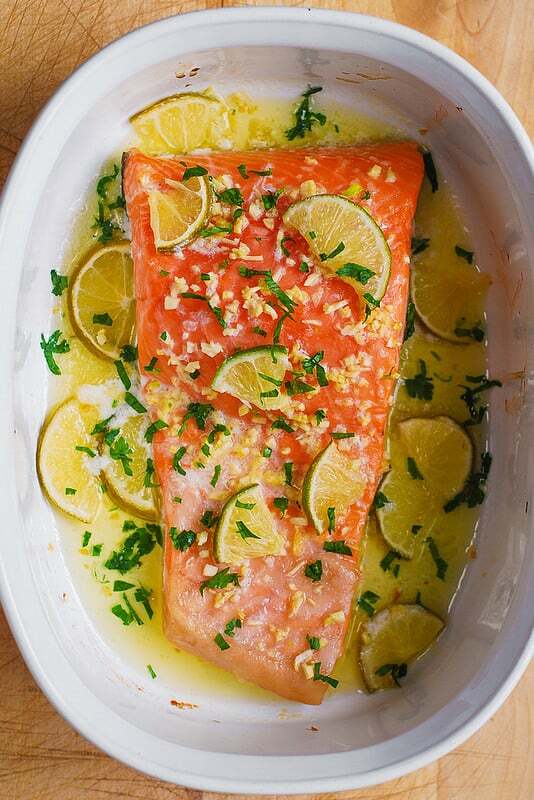 This easy baked salmon is made even more special by the addition of garlic, lime slices, and butter. To a medium-size casserole dish, add 1 tablespoon of melted butter and spread on the bottom. 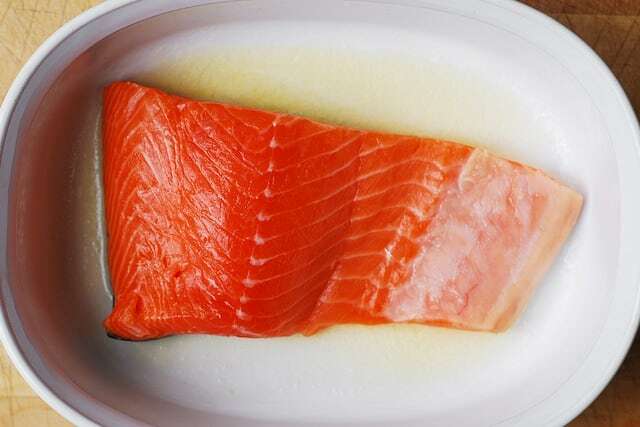 Add salmon fillet skin side down to the casserole dish. Sprinkle with salt on top. 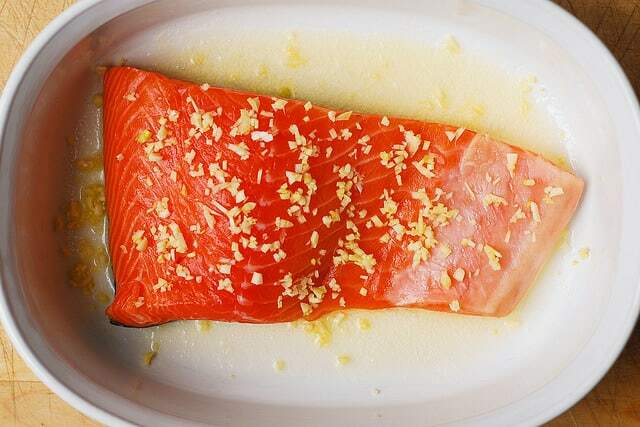 Top salmon with minced garlic. Add lime slices all around. Top with sliced butter, unmelted. Bake uncovered for about 20 minutes or longer (depends on your oven), or until the salmon is cooked through. Remove lime slices from the casserole dish. Serve the salmon over jasmine rice. Pour butter sauce over salmon and rice. Sprinkle with chopped fresh parsley. Sprinkle with extra lime juice (from the remaining half of lime), if desired. I am so glad you enjoyed this recipe. 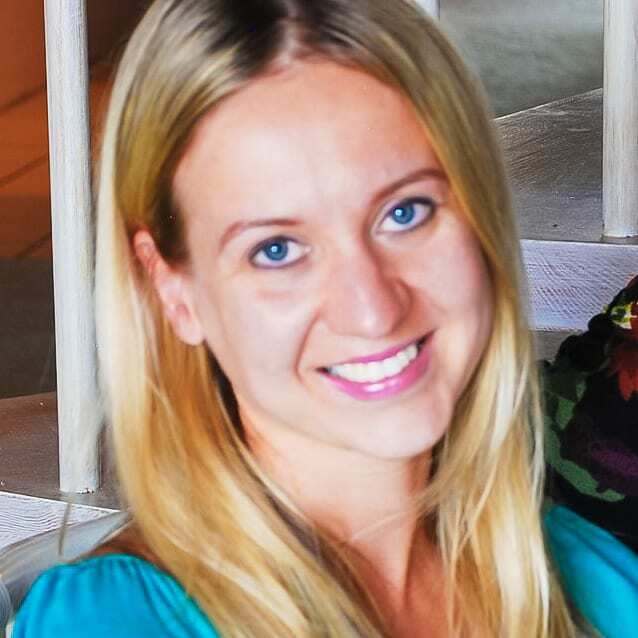 Thank you for stopping by and leaving your comment! I love everything about this recipe! So simple yet delicate and delicious… my husband loved it too! And the presentation is just adorable. Thank you!!! You’re very welcome! So glad you enjoyed this recipe. Thank you for your kind words! Thank you for this lovely recipe.The buttery juices were delicious mixed with the soft fluffy rice.Thanks again! You’re very welcome! So glad you liked this recipe! Thank you very much for detailed instructions ! Although it seems easy, it is not that simple to make a tasteful fish so this helps a lot !